The Great Priming Sugar Experiment: The Results! Just over two months ago on AG Brewday 3 I brewed an experimental batch of beer for the purpose of trying different priming sugars. A ‘standard’ light golden ale was brewed to provide a constant base but instead of using the same old white granulated sugar when it came to priming the bottles, I substituted in Muscavado, Golden Syrup, Maple Syrup, Treacle and Honey. Now four weeks have passed the beer is pretty much fully conditioned, and following a night with the ‘Tasting Crew’, I can now share the results! This was the control batch. Only here to give us an idea on what the base beer would have looked and tasted like so we could compare the others. As you can see from the image above this was the most carbonated of the six. This darker sugar had quite an impact on the beers colour, and produced a ‘burnt caramel’ aftertaste to the ale. Whilst I rated this as one of my favorite choices it was not a unanimous decision! There was no real alteration to the look of the ale, and the taste of the Golden Syrup was also mostly lost. This sugar pretty much only imparted a sweetening effect to the beer. 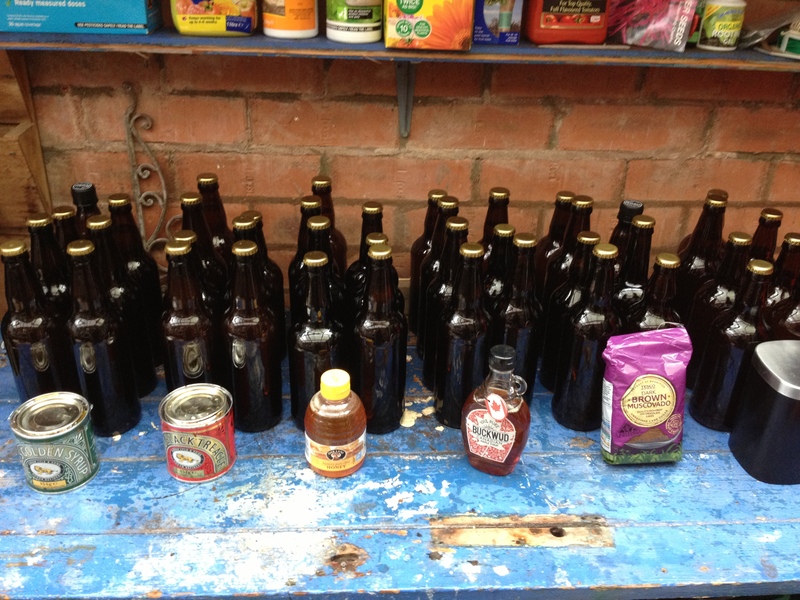 The Honey beer, was by far the clearest of the six after four weeks. A small change in colour from the original, and just a subtle hint of honey in both the smell and the taste. This was only a cheap Honey, so I would imagine a more expensive, purer Honey will give a more noticeable change. I had high hopes for this choice pre-testing, however the Maple Syrup only really sweetened the beer, and almost overly sweetened it too! Maybe there was the slightest hint of maple that could be tasted however there was no detectable aroma change. Overall this was the favorite beer, so we have discovered that my base beer must have been good, and the ‘Tasting Crew’ has a sweet tooth! As you can see the Treacle had a dramatic effect on the colour of the beer. The Treacle also is the least ‘soluble’ of the sugars so this also was the cloudiest of the six. There was a slight aroma change, and a noticeable aftertaste of Treacle, however this is definitely not suited to a Golden Ale, or anything where clarity is the desired effect! A good choice in a darker beer like a Porter or Stout though. I will be using this later in the year! Other than the White Sugar all of the experimental beers were unfortunately slightly under-carbonated which I believe will have had an effect on how much of their flavour was passed on to the beer. That said, there still was a definite change imparted from each individual sugar. If I choose to use any of these alternatives in the future then I will be upping the quantities slightly. The table below shows the quantity used for this experiment. 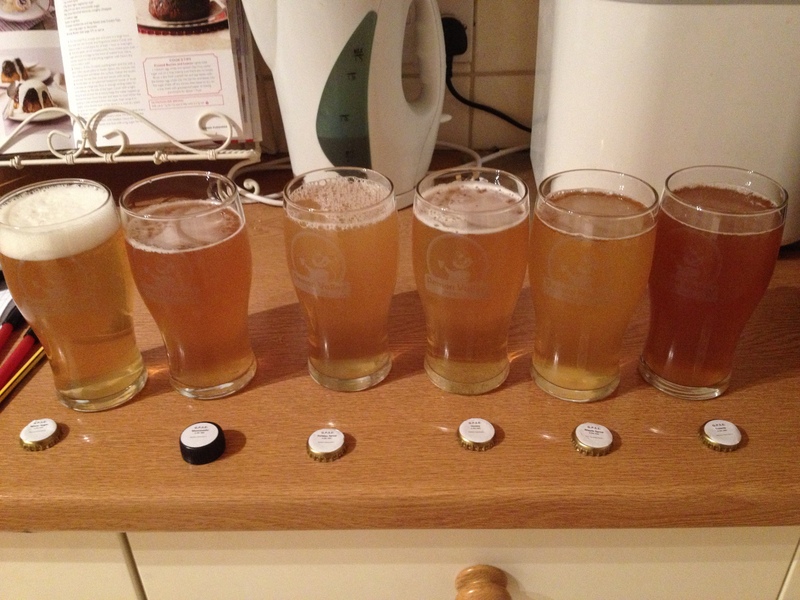 The experiment was definitely worth trying, and has given me some ideas which you will see in future brews! I’ll also be re-testing the beer in one months (8 weeks total conditioning) time, and probably every month afterwards until it runs out, and will see how/if the flavours develop further. Good work and thanks for posting. If you have any bottles left, it will be interesting to do a comparison in a few months’ time; perhaps the darker/more complex sugars will carbonate more fully?